The vibrancy of this gorgeous knitted Alpine hot water bottle (no.1) from the amazing Seven Gauge Studios is an accessory that I'd happily leave on view, and look at the warmth of the glowing orange print on Rob Ryan's Starry Sky cushion cover (no.2), I would love to see this set against a neutral sofa or armchair to create a really exciting contrast. Talking of contrasting colours, the pixelated design of Darkroom's Tokyo blanket (no.3) really does ignite a colour spark with the yellow-blue combo and pale pink trim. 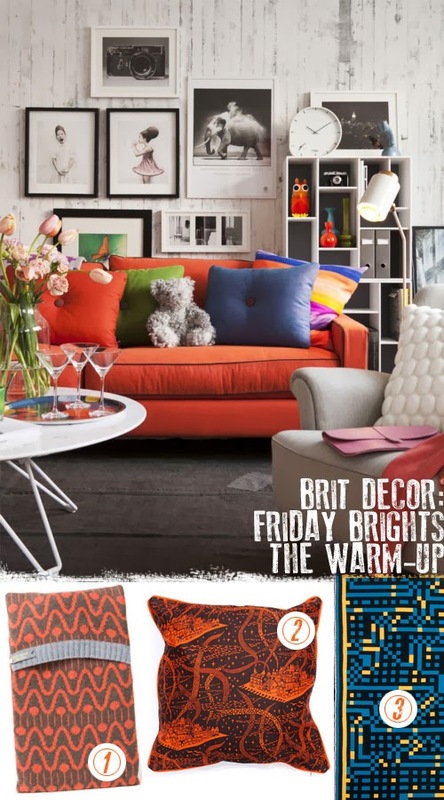 Combine all of the above colours and you suddenly have a bold and uplifting Friday bright palette!